The Victor Midnight Black Collection TM brings a fresh perspective to desk accessories by offering functional solutions with appealing design elements. The 9538-5 Multi-Use Storage Caddy provides compartments for small knickknacks and writing utensils, while providing a removable slot that allows you to adjust the middle compartment size for larger items. 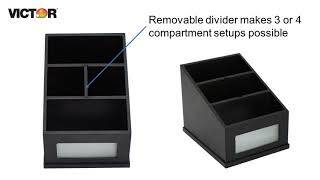 The 9538-5 is also the perfect accessory to add to your home to organize remote controls, make up, etc. Features sturdy wood construction with a durable double coated matte black finish. Frosted glass window adds a touch of class. Non-slip rubber feet reduce movement and protect your work surface from scratched and scuffs.